Living in a rural Alberta community comes with a unique set of challenges and rewards. We talked to three employees about their experiences living and working in rural communities. Arne, a Physiotherapist in Wainwright, Amy, a Registered Nurse (RN) working in Vermilion Long Term Care, and Kathy, Amy’s Care Manager. Discover the lifestyle, the friendly atmosphere, and the opportunities to grow your career that come with choosing rural. Arne: I was always involved in sports, and started taking kinesiology because of it. I wanted to work with athletes. Exercise has always been my passion. As I matured and grew, I learned how rewarding it is to treat people and help them through exercise, and then changed my focus to physiotherapy. Kathy: When I was young, there were only three career options if you were a girl: a teacher, a secretary, and a nurse. I had no interest in either of the other two, and wanted to help people, so nursing was for me. Amy: I’ve always wanted to help people, and have a few members of my family and extended family that are in healthcare. I went to Africa in grade 11 to build a facility and saw how much it helped people in need. How did you come to be in a smaller community? Arne: I grew up here. My wife’s from a small town too, so when we got married and started thinking of where we wanted to raise a family, it felt right to move back to a smaller community. Kathy: I was born and raised in Vermilion. After I finished nursing school, I moved back to my hometown to work. Amy: I never thought I would end up in a small town. My husband and I are from Kelowna, BC. We moved here because of my husband’s work. I started working here as a transitional grad nurse and have been here ever since. We’ve made some good friends and purchased a house here last year – we feel much more settled now. What does working in a smaller community mean for your career? Arne: In a big city like Edmonton, you might be focused on a single type of injury or patient, say orthopedics or cardiac rehab, whether you work in a city hospital or a private clinic. Here, I work with patients that have strokes, geriatric patients, lower leg injuries – basically, any patient that’s admitted to hospital, we’re seeing. Your scope of practice is much broader, and you have to be up on a variety of different illnesses, injuries, and treatments. Kathy: I worked as a general duty nurse, and then head nurse. Then I had my family, and was busy with that for a while. I went back to general duty, and then was a nursing coordinator. I worked at bedside for 22 years. Then I decided to do something a little bit different – I got a job in staff development with AHS and worked there for 10 years. My passion has always been long term care. I watched different managers come and go from this position, and realized that if I didn’t apply, I may miss the opportunity. So I applied and have been care manager since 2006. Amy: It’s a different pace, for sure. While things come up, in general, it’s not the same level of busyness. Kathy: In a rural hospital, you get a little bit of everything. 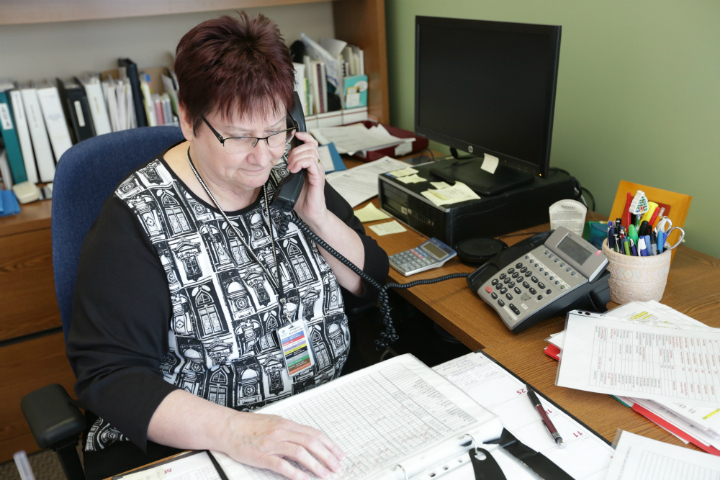 In long-term care, you get a little bit of everything except obstetrics. [Laughs]. You’re still using your nursing skills, you’re still using head-to-toe assessment skills, and you’re going to face a mix of medical diagnoses and the types of care required. What’s it like starting your healthcare career in a rural facility? 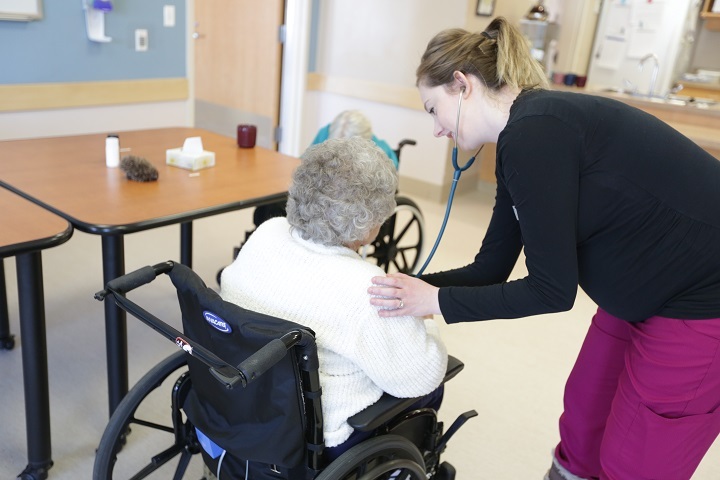 Amy: Starting as a transitional grad nurse, I learned so much from my team: the nurses, the healthcare aides, people that have been doing it for a long time. Each one of them gave me a different tidbit about nursing, and it’s interesting to see how different people apply the nursing process. Kathy: When we hire undergraduate nurses, that is, nurses who have finished their third year of training, there’s usually a two-to-three-day orientation for them. We base the orientation on the person. If you need more orientation, we’ll provide it. If you’re doing really well and you think your good, then we’ll transition you to working more independently. We pair the new nurse with an experienced nurse – we had Amy work with another RN – and they work the same shift, just days at first, until the new nurse feels more comfortable in their role. Once the new nurse has the skills down pat, we’ll move on to another one, giving coaching and feedback along the way. What do you like best about working in your community? Arne: I love that it’s a short commute. You can get almost anywhere within five or ten minutes. It’s not like living in a big city where you spend hours just trying to get home. There’s more time for other interests outside of work. I can go to the gym, play hockey, go cross-country skiing with my wife, or spend time with family. Kathy: You get to know people better. In the big city hospital I worked at during nursing school, you’d rarely see the same people on the floor more than once. At work, or in the community here, there’s my patients, their parents, children, or grandchildren. Amy: The people here are so nice! It’s very welcoming – I’ve made a great group of friends.